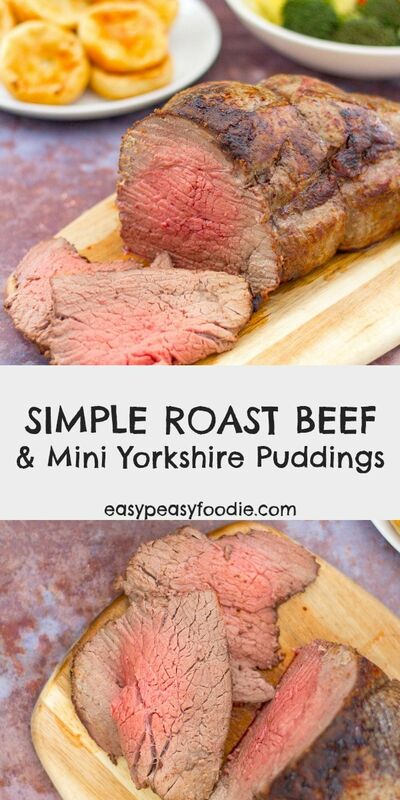 My Simple Roast Beef and Mini Yorkshire Puddings is easy to make and incredibly quick – 1h 15mins from turning the oven on to serving up! Perfect for when you need a roast dinner, but don’t have a lot of time. 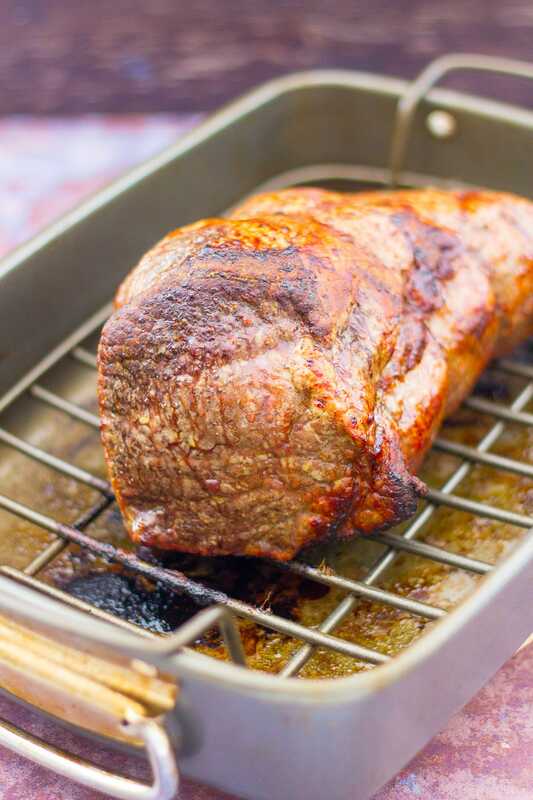 Most roast beef recipes call for the beef to be cooked at 180C – but I prefer to cook my roast beef a little hotter. I start my roast beef off at 220C for the first 10 minutes, and then turn it down to 200C for the remainder of the cooking time. This means a faster cooking time and a tastier ‘crust’. But if you follow the cooking times below, you should still get beef that’s beautifully pink in the middle. 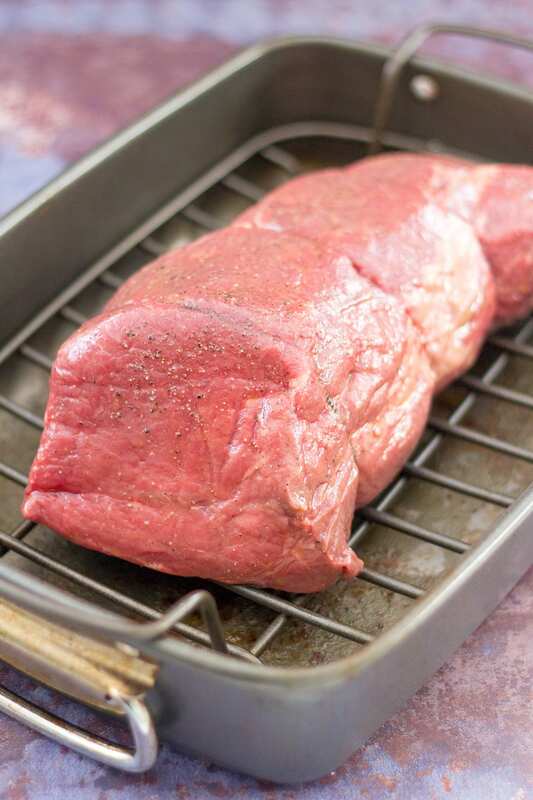 Another really good tip for super tasty, evenly cooked beef it to use a rack in your roasting tray. This allows for more even cooking and ensures you get that tasty crust all the way round. My rule of thumb is 20 minutes per 500g (1lb) for a joint of beef cooked medium-rare. So for a 1kg joint of beef, that’s 40 minutes. For a 1.5kg joint of beef that’s 60 minutes, and for a 2kg joint of beef that’s 1h20. Whatever length of cooking time you calculate, cook the beef for the first 10 minutes at 220C and then turn down to 200C for the remainder of the time. So for example, the recipe below is for a 1.5kg joint of beef – so this should be cooked at 220C for the first 10 minutes and then 200C for the remaining 50 minutes. This recipe is for medium-rare beef. If you prefer it rare, cook it for 10 minutes less. If you prefer your beef more well done, add an extra 10 minutes cooking time. Make sure you rest the beef for a minimum of 10 minutes after it comes out of the oven and before you start to carve – more if you have the time! When the beef comes out of the oven, I like to transfer it to a clean roasting tray (to catch all those delicious juices), and let the beef rest while I make the gravy, and finish off the Yorkshire puddings and vegetables. When everything else is ready, the beef is ready to carve. I don’t tend to cover my joint in foil as the kitchen is always warm enough by this point! 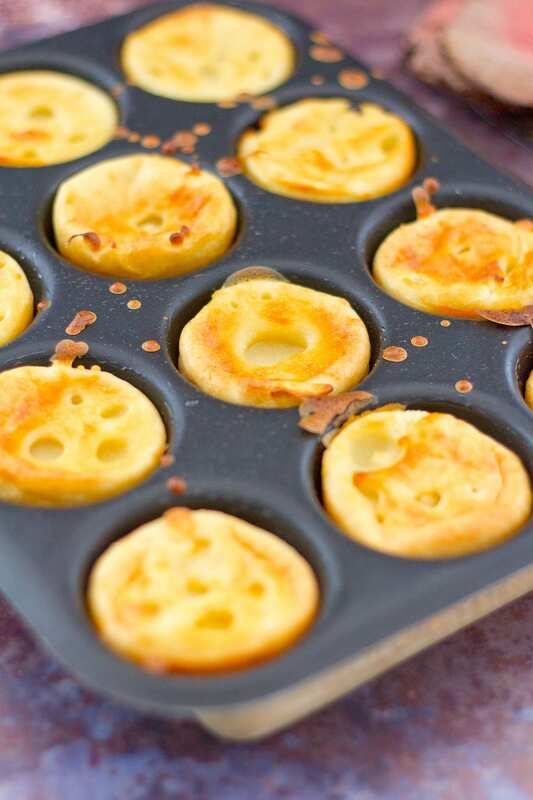 My Mini Yorkshire Puddings are made in a cupcake tray – making Yorkshire puddings is a cupcake tray means they are quicker to make AND you get more crispy bits – and, of course, the kids absolutely love them! I got the idea of making Mini Yorkshire Puddings from Jamie Oliver’s book 30 Minute Meals. However, I didn’t especially like Jamie’s recipe, as I found the Yorkshires were a little stodgy for my liking, so I’ve tinkered with the recipe to make them just perfect (same amount of milk and egg, less flour) and now they are just perfect – crispy on the outside, with just a little bit of squishyness in the middle. If you like these mini Yorkshire puddings, then you are going to love my Mini Toad in the Holes! If you like serving roast potatoes with your beef and Yorkshire puddings, you could absolutely do Easy Peasy Roast Potatoes, but I find roast potatoes AND Yorkshire puddings too much of a carb overload! I prefer to serve the beef and Yorkshire puddings with some simple veg. I usually do cabbage, broccoli and a carrot and swede mash, all of which can be prepped ahead of time and finished at the last minute. I boil the carrot and swede for 10-15 minutes and then mash with a little bit of butter, salt and pepper. I steam the cabbage and broccoli above the carrots and swede for about 7 minutes. 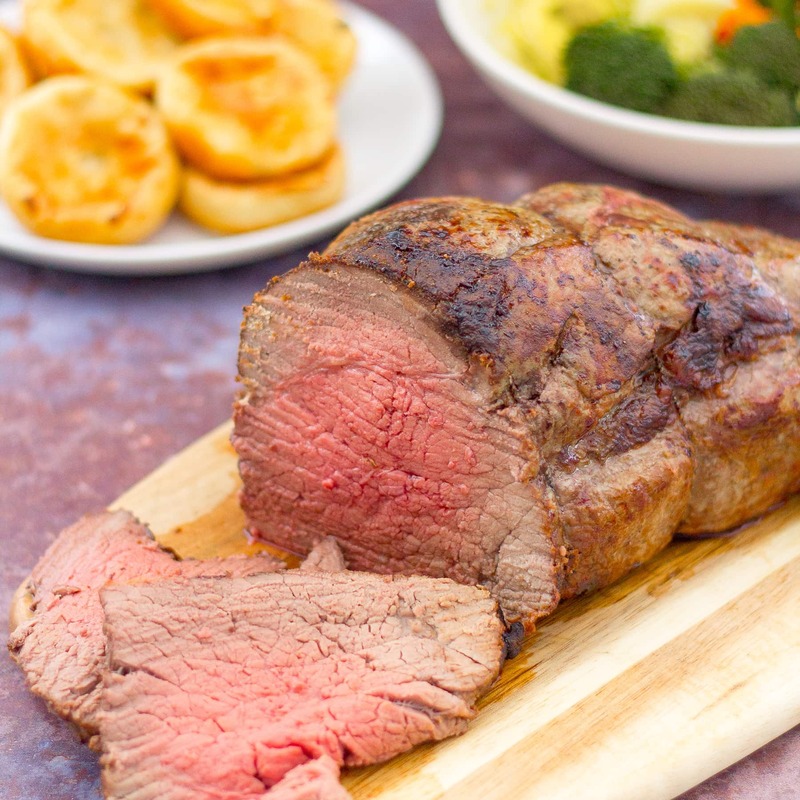 I make a super easy gravy for my Simple Roast Beef and Mini Yorkshire Puddings. I simply mix together flour, a beef stock cube (I like Kallo Organic Beef Stock Cubes) and a small amount of cold water. Once it’s mixed to a paste, top up with 400ml boiling water from the kettle. Once the beef is out of the oven, and resting on a clean roasting tray, I simply tip the gravy mixture into the tray and heat gently to release the great flavours from the bottom of the tray! I strain this into a clean sauce pan and add the resting juices. I then reheat the gravy just before serving. 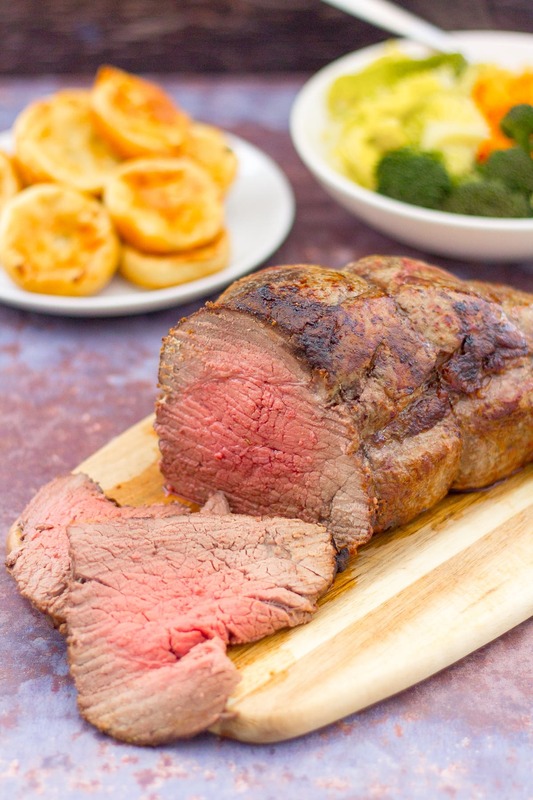 What to drink with roast beef and Yorkshire puddings? My favourite wine match for roast beef and Yorkshire puddings has got to be Claret – roast beef and red Bordeaux is such a classic combination! But roast beef also goes well with other Cabernet Sauvignon/Merlot blends, Syrah/Shiraz and, of course, Malbec. If you’d rather drink beer then I’d recommend a classic British ale to go with roast beef and Yorkshire puddings. I tend to allow roughly 200-250g roast beef per person. So a 1.5kg joint will typically serve 6-8 people. Obviously if some of your people are children, this means your joint will stretch further. For the 4 of us (2 children, 2 adults), that means we will have plenty of leftovers! 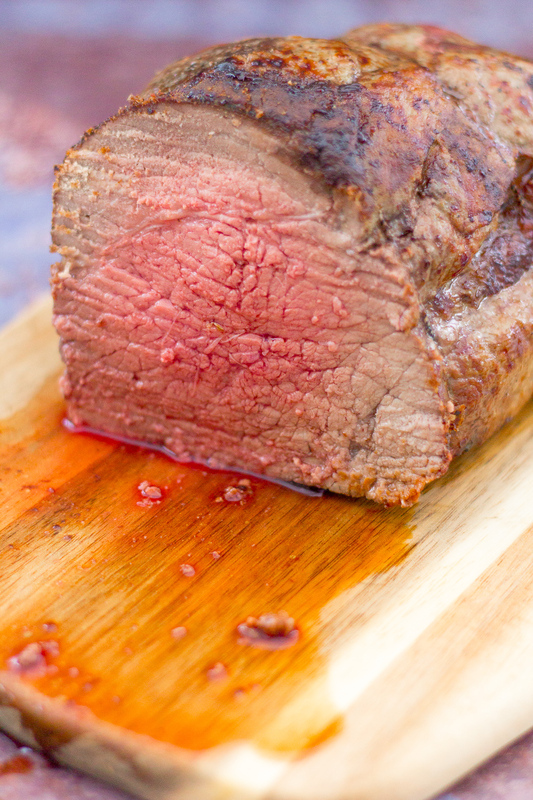 Ideally, remove your beef from the fridge 30 mins to 1 hour before cooking. Pre-heat your oven to Preheat the oven to 220C / 200C fan / gas mark 7 / 425F. 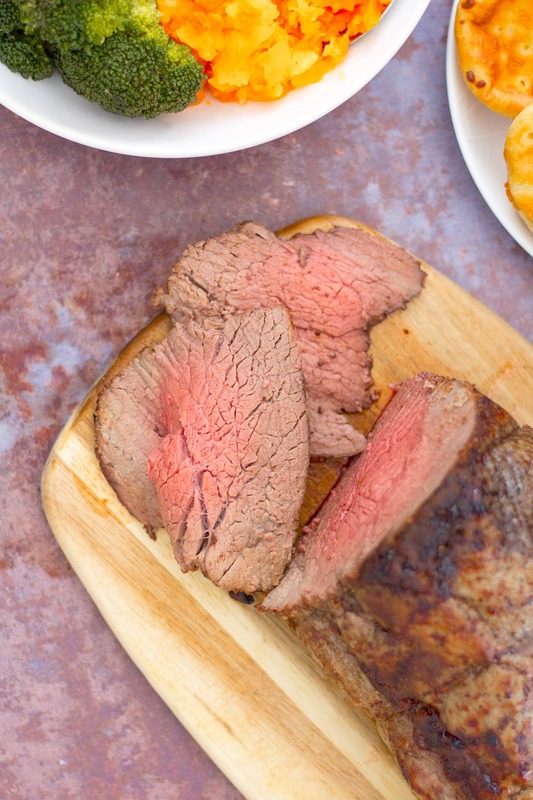 Get your beef out of its packaging and stand it on a board. Drizzle the beef with olive oil and sprinkle with salt and pepper. Rub the oil, salt and pepper all over the beef. When the oven reaches 220C, put the beef in the oven for 10 minutes. After 10 minutes turn the oven down to 200C / 180C fan / gas mark 6 / 400F and cook for a further 50 minutes. Rest for 10 minutes (more if you can) and then carve and serve. Put the flour. milk, egg and salt in a bowl and whisk together using a hand whisk (or an electric one, if you prefer). Ten minutes before the beef is due out of the oven, get a cupcake tray and put a drizzle of olive oil in each little compartment. Put the tray into the oven to heat the oil. When the beef comes out of the oven, turn the heat back up to up to 220C / 200C fan / gas mark 7 / 425F and get the bun tray out of the oven. 2/3 fill each hole with the Yorkshire pudding batter and return the tray to the oven. Cook for 12 minutes until puffy and golden. N.B. Don’t open the oven door while they are cooking! When you have put the Yorkshire puddings in the oven, it’s time to make the gravy. Remove the fat from the tin you roasted the beef in and put the tray on the hob over a low heat. Pour in the jug of beef gravy and stir to incorporate the bits on the bottom of the tin. Add the juices from the resting beef and then cook the gravy on a low heat for about 5 minutes. Strain into a clean saucepan, using a sieve. Reheat the gravy just before serving. I prep all the veg straight after I have put the beef in the oven. I peel and chop 2 carrot and half a small swede into roughly 1cm cubes. I slice half a savoy cabbage into roughly 1cm strips and I cut the broccoli into small florets – or quite often I use tenderstem broccoli so there is no prep at all. I put the carrot and swede in a sauce pan and the green veg in a steamer that fits on top. If you don’t have a steamer you can boil the green veg in a separate saucepan instead. I put the carrot and swede on to boil for 15 minutes just before I take the beef out of the oven and I pop the steamer on top 7 minutes before the carrot and swede is ready. When the veg is cooked, I quickly mash the carrot and swede with a little butter salt and pepper, and then serve. (1) Allow 20 minutes per 500g (1lb) for a joint of beef cooked medium-rare. So for a 1kg joint of beef, that’s 40 minutes. For a 1.5kg joint of beef that’s 60 minutes, and for a 2kg joint of beef that’s 1h20. (2) Whatever length of cooking time you calculate, cook the beef for the first 10 minutes at 220C and then turn down to 200C for the remainder of the time. (3) This recipe is for medium-rare beef. If you prefer it rare, cook it for 10 minutes less. If you prefer your beef more well done, add an extra 10 minutes cooking time. Suitable for freezing (beef only). This looks perfectly cooked Eb! 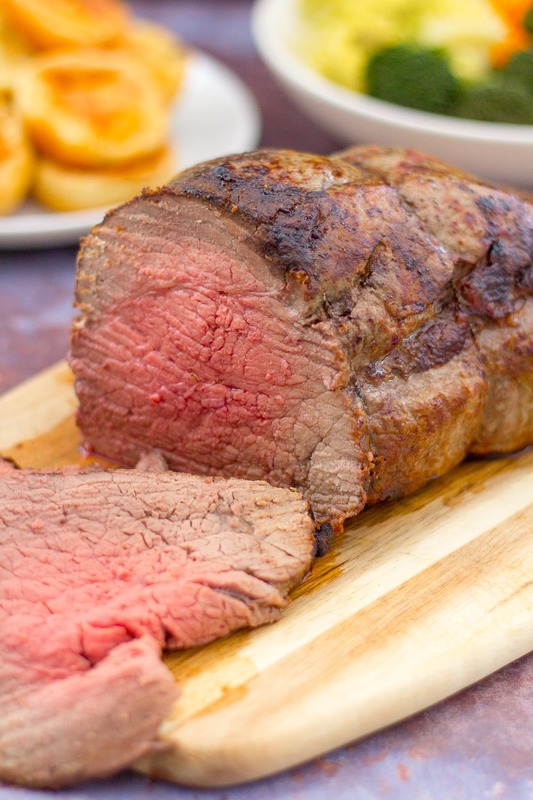 You just can’t beat roast beef on a Sunday!